﻿ VII. What plan of the text The Mersey Tunnel is better? Why? VII. What plan of the text The Mersey Tunnel is better? Why? Some call the Central Artery/Tunnel Project in Boston, Massachusetts, the "largest, most complex and technologically challenging highway project in American history." Others consider it one of the most expensive engineering projects of all time. Locals simply call it the "Big Dig." 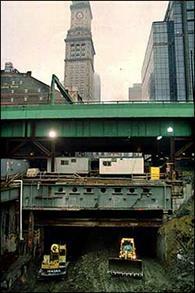 The tunnel is eight lanes wide, 3.5 miles long, and completely buried beneath a major highway and dozens of glass-and-steel skyscrapers in Boston’s bustling financial district. What does it take to dig a tunnel like this? A lot of hard work and a handful of engineering tricks. Today, engineers use special excavating equipment, called "clamshell excavators," that work well in confined spaces like downtown Boston. These special machines carve narrow trenches -- about three feet wide and up to 120 feet deep -- down to bedrock. In Boston, engineers are pumping liquid slurry (clay mixed with water) into the trenches to keep the surrounding dirt from caving in. Huge reinforcing steel beams are lowered into the soupy trenches, and concrete is pumped into the mix. Concrete is heavier than slurry, so it displaces the clay-water mix. The side-by-side concrete-and-steel panels form the walls of the tunnel, which will allow workers to remove more than three miles of dirt beneath the city. As if tunneling beneath a city isn’t hard enough, the soil beneath Boston is actually landfill -- it’s very loose and soggy. Engineers had to devise a few tricks to keep the soggy soil from collapsing. Their solution: freezing the soil! Engineers pump very cold saltwater through a web of pipes beneath the city streets. The cold pipes draw heat out of the soil little by little. Once frozen, the soil can be excavated without sinking. Engineers also inject glue, or grout, into pores in the ground to make the soil stronger and less spongy during tunnel construction. 1. The project will excavate a total of 15 million cubic yards of dirt, enough to fill Foxboro Stadium -- where the New England Patriots football and Revolution soccer teams play -- 15 times. 2. Reinforcing steel used in the project would make a one-inch steel bar long enough to wrap once around the Earth at the equator. 3. Moving all the dirt in the tunnel will take more than 541,000 truckloads. If all those trucks were lined up end to end, they'd stretch 4,612 miles. That's the same distance from Boston, Massachusetts, to Brasilia, the capital of Brazil. 4. The tunnel will emerge next to the FleetCenter, home of the Boston Bruins hockey team, and will cross the Charles River under the widest cable-stayed bridge in the world, the Charles River Bridge. 1. The Central Artery/Tunnel Project is called the most complex and the most expensive project in the world. 2. The tunnel is located in Boston’s commercial district. 3. Some skyscrapers are above the tunnel. 4. Though the tunnel is considered the most expensive project, it was quite easy to build. 5. Clamshell excavators are used in closed spaces. 6. These special machines dig rather wide trenches. 7. Liquid slurry is sand mixed with water. 8. Liquid slurry helps to keep dirt away. 9. Huge reinforcing steel beams are lowered into the soupy trenches to remove slurry. 10. The soil beneath Boston is easy to work with. 1. What project can you name challenging? 2. What does ‘a handful of engineering tricks’ mean concerning the tunnel described? 3. How do clamshell excavators operate? 4. What is liquid slurry pumped into trenches for? 5. What’s the aim of side-by-side concrete-and-steel panels?